I’m not really much of a Jazz player, but I am a guitar guy and I’m definitely a Guild guitar guy, so when the chance came about to buy a Guild X-500 made in 1984, I jumped at the chance under the premise that it would inspire me to brush up on my jazz chops. Being a gear hound, the chance for a second X-500 of similar vintage (1986) was too good to pass up so I ended up with two of these big ‘ol Guilds and thought, “Why not write about them?” and here we are. These guitar were a bit of a challenge for me to write about because their proper use is a bit outside of my comfort zone. They are guitars, however, and me being me, I was not afraid to sit down and run them through their paces in order to write up what I could about the instruments. Let’s dig in and see how they fared. The Guild X-500 is a fairly typical jazz box guitar of the type that comes with built-in pickups. It’s fully hollow, has a laminated top and sides, and is a full-depth instrument that has a fair bit in common with a traditional acoustic guitar, though not quite as much as the higher-end jazz guitars like the Guild Artist Award. High-end jazz guitars like Guilds Artist Award models have no electronics or controls cut into the top in order to maximize the instrument’s sound because the sound is generated by the top. They also have carved solid tops and cost a lot of money because they are usually hand-crafted instruments built for jazz. A step below those boxes are the high-end jazz boxes that look similar to the X-500, but come with solid carved tops, Guild’s version being the X-700. The X-500 is similar to the X-700, but comes with a laminated top which cuts the price down a great deal. Based on this naming system one could argue that the X-500 is the third from the top of the line in Guild’s electric guitar line, though the Artist Award is really an acoustic instrument that happens to have a pickup on it. If you take a step down from the X-500, you end up in the Guild X-175/X-170 range where you start to lose the finer appointments like the bound f-holes and ebony fretboards, not to mention the high-end abalone inlays. 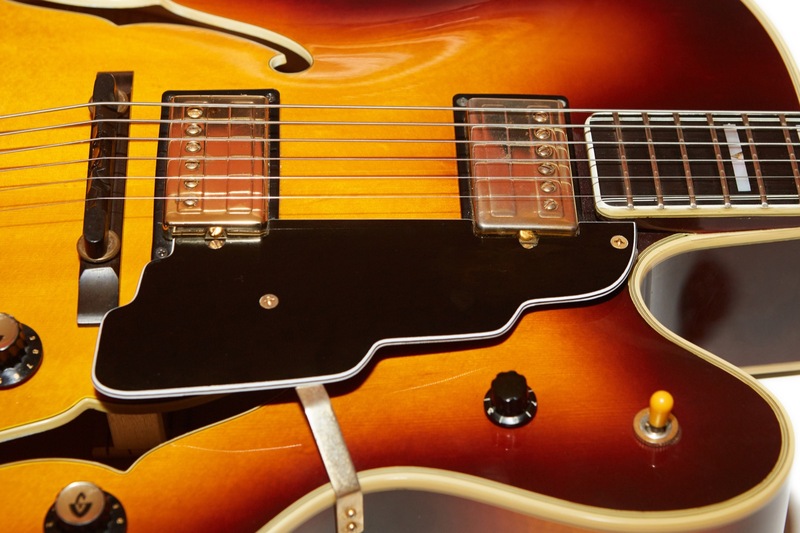 The Guild X-170 (called the Manhattan) is also thinner than the larger X-500 and X-700 jazz boxes, and was designed to be a slimmer version of the X-175. Of course, I haven’t even included other arch-tops like the X-180, X-185, A-150, and who knows what else. As usual, if you’d like to learn more about Guild models and the company’s history, I encourage you to get a copy of The Guild Guitar Book by Hans Moust. These are a lacquer-finished instruments which are surprisingly devoid of the typical wear given that they are now 30+ years old. The guitar to the right is labeled as a sunburst and clearly is, but the other one in the pair, while also labeled a sunburst, is a sort of walnut sunburst that I had never seen before. The sticker in the f-hole does not mention walnut (Guild has a walnut finish that is usually labeled with the suffix -wal) at all. The deep tone of the finished in contrast with the gold hardware makes for a striking combination and really allows the white binding on the f-holes to stand out. They are both absolutely stunning guitars in person. For the remainder of this article I will refer to the colors of these guitars as cherry-burst and walnut in order to spare you from the grammatical gymnastics that would be otherwise necessary to differentiate them in print. These guitars both have beautiful bound ebony fretboards and magnificent inlays. I’m a sucker for the mother of pearl and abalone inlays that Guild puts on its high-end guitars, and these are just mesmerizing to look at in the right light. They are perfectly installed and contrast beautifully with the utterly black fretboards. This inlay design is probably my favorite production inlay of all time. The neck width is advertised as 1 5/8″ for both of them, and while the walnut one measures at a perfect 1 5/8″ at the nut, the cherry-burst example measures at 1 21/32″ which is exactly halfway between 1 5/8″ and 1 11/16″. Both necks are deep enough not to feel like some of the early 1970s Starfires I’ve owned (in other words, like a pencil), but the very slightly wider cherry-burst neck feels much nicer in my hand. Since I’m not doing crazy ’80s style leads on this guitar, even the thinner neck on the walnut model doesn’t bother me too much, though when cramming my fingers together into some wacky jazz chord I’ve never seen in an AC-DC song, it can get a bit cramped. The frets are wide and have enough height that I don’t feel like they’re too small which is another trait of early ’70s Starfires that I generally dislike. The fretboard radius of both appears to be about 12″ according to my StewMac fret radius gauges. The X-500 was advertised as having “wide frets on a curved fretboard”, which is a bit vague, but I guess a 12″ radius is more curved than some out there though, again, the necks on the mid-’80s models are on the small side so watch out for that if you like wide necks. Given the stair-step pick guard with the Guild logo in cursive, I’d venture that the ad I got the “curved fretboard” quote from is from the late 1970s, so it may not be a fair reference to make. The neck on the walnut X-500 is perfectly straight and shows no sign of needing any work, whatsoever. I attribute the very straight necks on Guilds like this to the multiple wood-types used to make the necks which is usually shown as a stripe down the back of the neck. This guitar has a triple stripe as the neck is actually a five-piece neck. 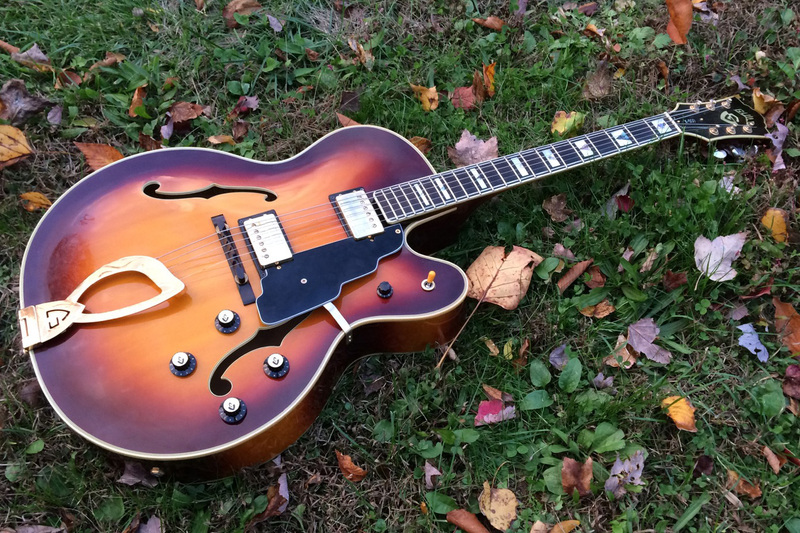 The neck on the 1986 X-500 I have isn’t quite so perfect, and though the details have nothing to do with the build-quality of the guitar, they are worth covering for the curious and to serve as a permanent record should I ever decide to sell it. The cherry-burst X-500 has some issues that I knew about when I bought it, taking the chance that the problems were not as bad as they appeared. The issue is a crack along the heal that separates the neck heel cap from the binding on the guitar body. When I first looked at this, I was convinced that neck had separated from the body, probably as a result of major impact, and that it would require a complete reset. 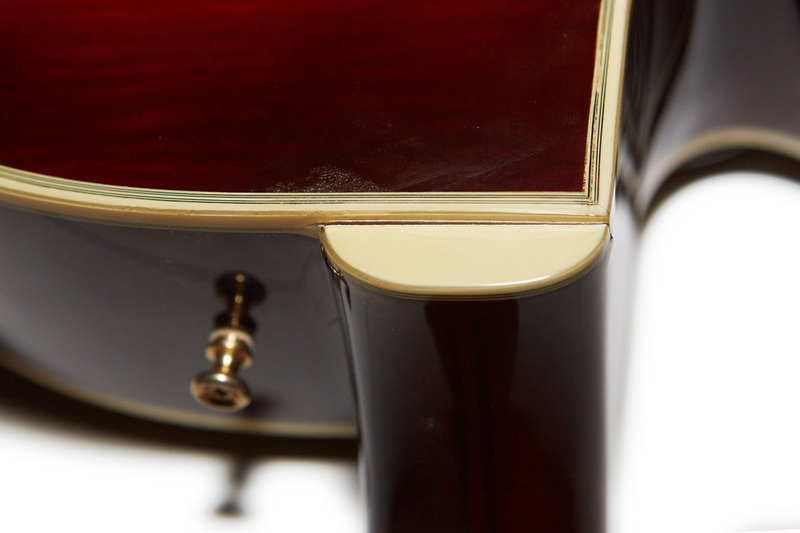 Upon receiving the guitar, however, I saw no signs on impact and though the crack extends into the finish on both sides, the neck is rock solid, I cannot cause the crack to expand or contract, and the guitar stays in perfect tune. The good news is that I got the guitar for a good price. The bad news it that the crack is a mystery, and I hate a mystery. My current theory is that the crack is a result of heat and/or humidity damage, but I’m not entirely convinced of that, either. The guitar is almost mint in every other discernible way except for some minor binding rot. The gold finish plating isn’t even worn on the pickups. Like all Guild guitars I’ve ever owned (and there’s been more than a few), the build quality is great, and on premier instruments like these, it’s possibly even better. I don’t consider the neck issue listed previously as a build quality issue because there’s no way the guitar left the factory like that. Something happened to it. I just don’t know what. There is really only one complaint I have with the build quality, if that’s even the proper category for this discussions, and that is the relatively thin gold plating on everything thats plated. This is most notable on the pickups, which will be covered in detail in the next section, but every gold-plated surface on the walnut X-500 guitar is significantly worn.The cherry-burst is in great shape, but I don’t think it was played much. To be fair, many guitarist dislike gold hardware specifically because it wears with use and tends to look bad over time, but Guilds are notorious for seemingly having an even thinner gold plating than other brands. I have no idea if that’s true or not, and since this is electroplating we’re talking thicknesses in the realms of micro-inches (1/1,000,000 inch) and microns (1/1,000 millimeter), thicker can mean the difference between .762 microns (class-0 plating) and 1.25 microns (class-1 plating). Since gold is so soft, it’s easy to wear down such a thin layer over time. The problem from a cosmetic point of view is that on a guitar like this where the wood and lacquer look very, very, good, the gold-plated parts look terrible. The wear is uneven looking in this case, almost as if someone swapped in cheap parts in an expensive guitar. As stated, the cherry-burst X-500’s plating looks great. For now. To be perfectly fair, all of those parts function perfectly and there is no impact to the playability or function of the guitar, so many people will chide those of us that like new-looking instruments with the ultimate implied insult, “but how do they sound?” Spoiler: They sound great. The pickups are gold-plated Guild HB-1s, which are possibly my favorite pickup of all time, whether regardless of how they’re plated. When I first got the walnut X-500, I pulled the old strings off, cleaned it up, polished the frets, and put on a set of Ernie Ball Regular Slinky (10s) round-wound strings. Those strings are not what this guitar was made for, and the guitar let me know in the form of sub-par tone and enhanced finger noise. I went to Guitar Center and bought a set of medium-gauge (13s) flat-wound strings to see how they would work. I’m not a fan of flat-wounds for various reasons, but that’s often what gets put on a guitar like this so I tried them. They sounded terrible. Yeah, i know, I said above that they sound great. Read on. Surprised that anything would sound terrible on a guitar like this, I started to analyze the situation and decided that the pickups were too close to the strings which was causing a very boomy, almost unpleasent sound, especially on the larger strings. After backing off the pickups a bit the guitar opened up and the sweet woody timbre of the instrument started to shine through. 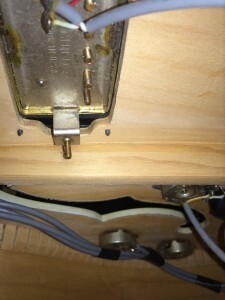 Next, the pickups had been adjusted for strings that did not match mine so I had to re-adjust the pole pieces because they simply did not work for the strings I had chosen. 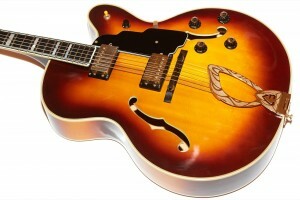 HB-1s are great because they’re clear and crisp with a bit of upper-end response that isn’t present in most other humbuckers, but this is a big boomy jazz box so their upper-end character is easily lost, especially if you’re fond of rolling the tone back as some people like to do on these guitars. With the pickups dialed in, the guitar finally sounded great. One of the cool things about these guitars is that they’ll do that treble rolled off jazz type of sound, but with the bridge pickup on and those killer HB-1s in place, these guitars will rock, too. I wouldn’t use one for playing Crazy Train in an ’80s tribute band, but some Ted Nugent? Why not? 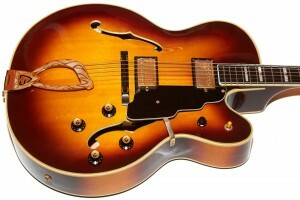 He did use a ’62 Gibson Byrdland, after all, though that would be more like Guild’s X170 than one of these big-box X-500s. The electronics are like most every other two-humbucker guitars out there, though these guitars includes a master volume which is a nice touch. 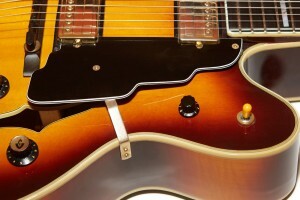 There are no pops or crackles or other problems that can crop up on guitars of this age, though if I had to gripe about something it would be that the toggle does not point up and down and instead seems to point to the middle of the neck when in neck position and about 45 degrees east of down when in the bridge position. Being the tinkerer that I am, I set about loosening the nut and turning it back, but there seems to be some sort of cable binding issue going on that prevents this from being turned. I though I’d need to scope it out with some dental mirrors to see if it’s already been turned and managed to wrap the exiting cable, or something, but I got a bore scope and discovered that it was apparently put in at that angle on purpose and the wires running to it are just very tight. My second X-500 has the switch situated in exactly the same way. The wiring inside the 1984 walnut X-500 is all done with the same colored grey wire used in most Guilds of this era. The wiring is neat and tidy and is tied down with electrical tape. Interestingly, the wiring in the 1986 X-500 is all black as you’ll see later on in a comparison picture. As a quick aside, if you zoom into the pic you can see the cutout for the pickup in detail which shows the laminate layers in the top. 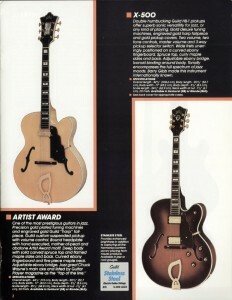 You gotta pay X-700 money to get the carved top version of a guitar like this. Sorry the picture isn’t any better. I could only shove my iPhone 5s so far into the f-hole without risk of it falling in there. Suffice to say that was a problem I was not eager to solve and you should all be ashamed for giggling at the unintentional double entendre. As stated previously, most of the gold has worn off of the metallic hardware on the walnut X-500 guitar, likely because it’s just such a great guitar that it needed to be played. Thankfully, someone took great care of it and the only real wear on the instrument is the faded gold electroplate. 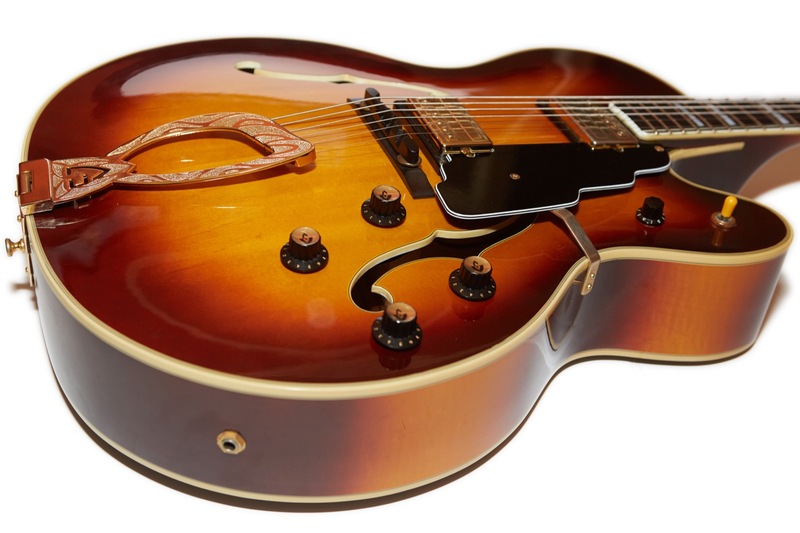 The cherry burst X-500 is in even better shape. The tuners on the walnut 1984 X-500 are Guild emblazoned Gotohs tuners which are one of my favorites (along with Schallers), so I’m a happy guy in that department, though the tuner buttons have much of the gold worn off along with other well-rubbed metal parts of the guitar. 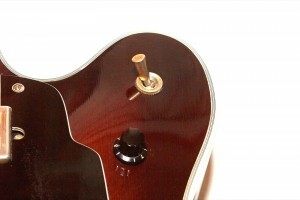 The tuners on the cherry burst 1986 X-500 are grovers. 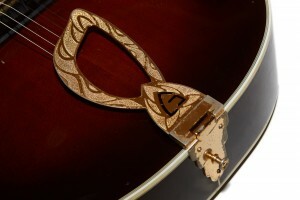 On nicer Guild archtops, an engraved gold harp piece is included. I love the iconic Guild harp tailpieces, and the gold ones just take it to a whole new level. 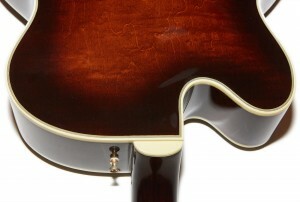 The example on the cherry burst X-500 shows the beautiful detail of the harp and displays very little if any wear. 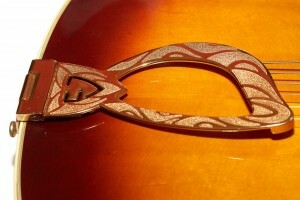 Surprisingly, the harp tailpiece on the walnut X-500 guitar seemed devoid of the wear seen on the rest of the guitar. That is, until I looked at the mounting part of the assembly, which has enough wear to compensate for the beautiful untarnished top piece. I’m not sure how wear like this happens, but my suspicion is that the mounting part of the assembly is made from different material than the harp itself, and the mounting bracket is more prone to wear. Perhaps it worn because of strap friction since the strap peg is right there. While the hinge and mounting plate look pretty terrible, the piece that people see when you play looks damn-near brand new, and if I had to pick one or the other to be worn, the I’d pick the one that is. Honestly, I didn’t even notice the wear on the end of this guitar until I set it down to take these pictures. I mean, how often do you look at the bottom end of your guitars? Guilds of this era (the mid ’80s to mid ’90s) employ a pick guard design that I really dislike. 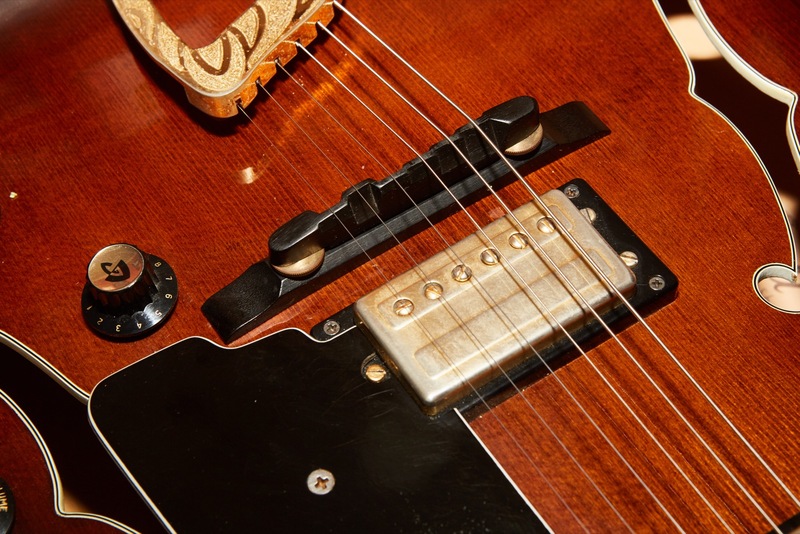 My beef with these guards is that they sit on top of the pickup rings which means they’re higher and thus closer to the strings which means that they get in my way when I play, especially when playing more aggressively with a pick as I’m prone to do. Thankfully, the pick guards from the 1980s don’t include any obnoxious logos like the earlier and later examples do. 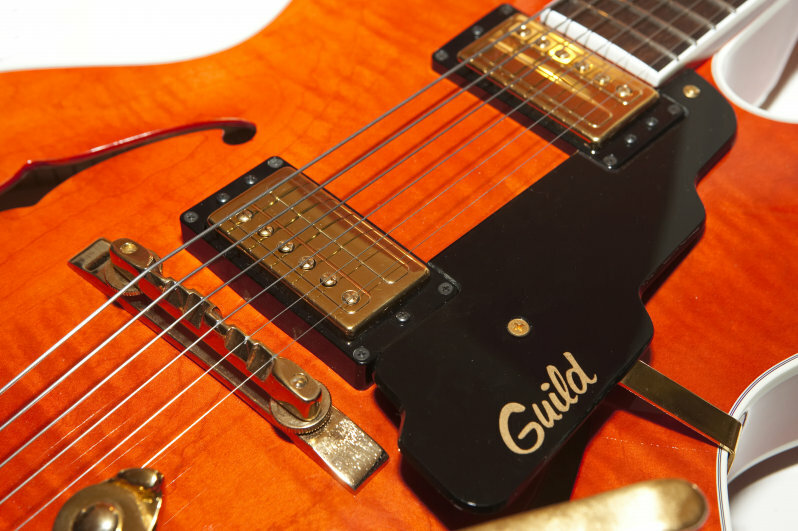 Guild fixed this in the late 1990s when they reintroduced many of their iconic models, and on my my late ’90s and early ’00 Guilds the pick guard is much improved. The orange Guild X-170T from the early 2000s shown to the right has the much improved pick guard, even if it does include an obnoxious logo. Note the difference in trim level on the later X-170T compare with the X-500. Not only does the X-500 have better inlays, an ebony fretboard, bound F-holes and a master volume, but it also has an ebony bridge more suited to jazz and real Guild HB-1 pickups instead of those terrible Fender HB-1 wannabes on the Fender-era Guild X-170T. Note that on a regular Guild X-170, a rosewood bridge is supplied. The brass bridge like the one shown is specific to the “T” models since it works better with the Guildsby while also really brightening up the tone. These are not rock guitars. Well, they’re not really designed to be rock guitars, but with those killer Guild HB-1 pickups and an amp with some guts inside, this thing will growl with the best of them. Of course, most people don’t buy an X-500 to show off their Van Halen chops. With its deep hollow body, ebony bridge, harp tailpiece, and properly adjusted pickups, the guitar has a very woody sound that none of my other guitars can attain. Note that those these two guitars are X-500s and are only two years apart (1984 and 1986), they actually behave a bit differently from one another. 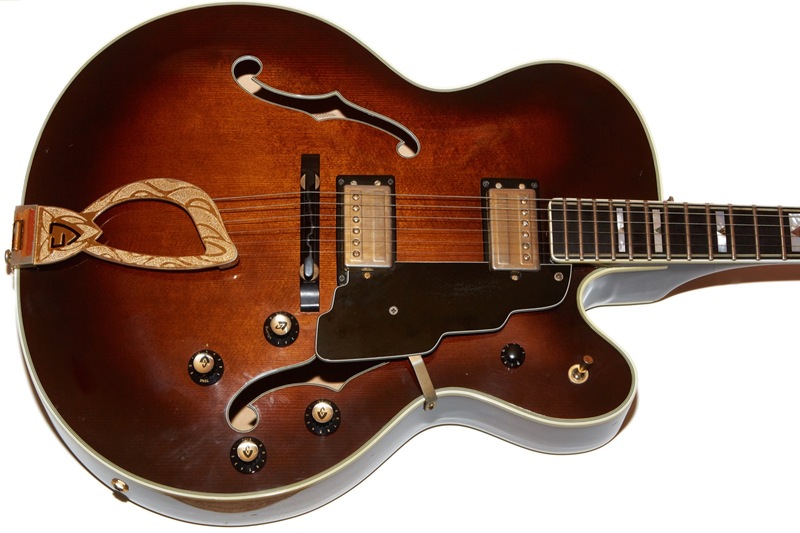 The reason they behave differently is that the 1984 walnut X-500 is a true hollow-body with only a couple of small sound posts inside the body likely to maintain structural stability in the big guitar. The 1986 cherry burst X-500 had a big ‘ol honkin’ sound block right under the bridge in addition to the other smaller posts. Apparently the larger sound block was added to the X-500 right around the time of this guitar’s build date in an effort to manage feedback better, and indeed, while the 1984 X-500 feeds back with amazing ease even at low bedroom volumes, the 1986 X-500 with the block really doesn’t feed back unless I want it to. While the sound block benefits the guitar by reducing feedback, it also deadens the guitar acoustically which is a real shame for a guitar that is ostensibly designed for jazz. Indeed, the 1984 walnut X-500 without the sound block under the bridge is a much livelier instrument that feels more like an acoustic guitar because it is much louder when played acoustically. 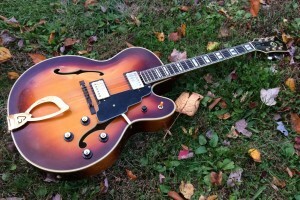 The 1986 cherry burst X-500 with the sound block feels a bit “deader” in my hands. I would describe the feeling of playing the 1986 X-500 as being very similar to the way a Guild Starfire IV feels when played unplugged. 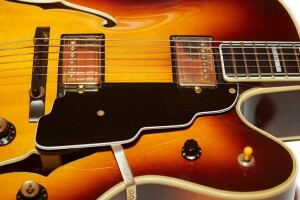 In short, you feel like you want to plug it in, which is not the case with the true hollow body without the sound block. Whether or not this difference is audible through an amp on stage with a band is debatable, but the purist in me says that a guitar was advertised and sold as a jazz box, and thus should not have the block, though I suppose the use of the term “crossover jazz” in the ad give them a certain amount of leeway. All recordings in this section were recorded with an Olympus LS-10. 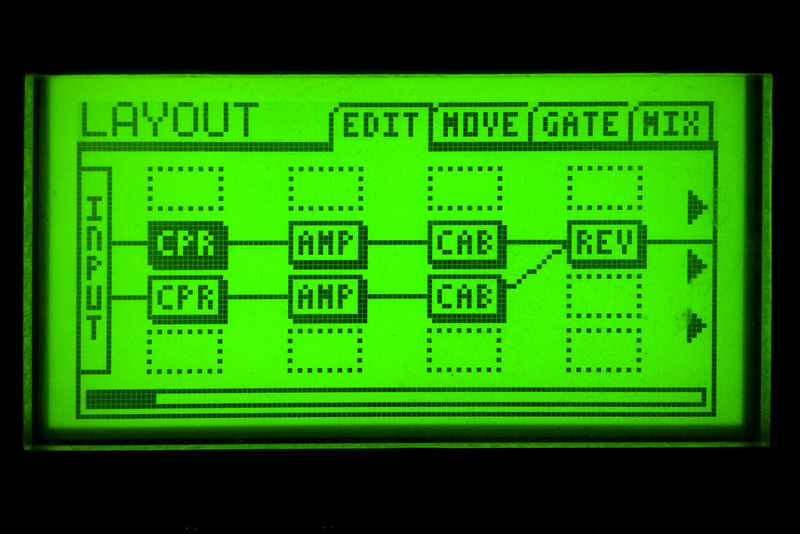 The amp is an Axe-FX Ultra set as outlined below. The speaker is a QSC K12. All guitar knobs are on 10 for all recordings. For the sound recordings I put the same strings on both guitars in the hopes that any differences in the character of the guitars themselves might come through. 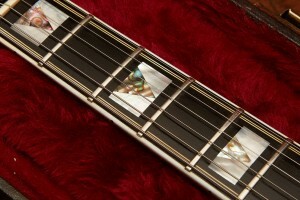 The stings in use are D’Addario XL Chrome flat-wounds 12-52 strings. I chose these strings because they were the only flat-wound strings I could find at any music store in a 20 mile radius, and even then they were the last two packs. I did buy a couple of sets Thomastik-Infeld JS112 jazz guitar strings on Amazon only to discover that the silk-wound ball ends of the strings would not seat into the harp tailpiece so I had to abandon those unless I wanted to alter the beautiful harp tailpiece. The amp is my Axe-FX Ultra, though for this article I did not use one of the standard patches, opting instead for one that I’d put together on my own because I did not like any of the stock offerings. The compressors are “Studio” and the amps are both “Jazz” (Based on Roland JC-120). The top cab is “2×12 Black” and the bottom is a “2×12 Boutiq” (that’s how they spell it). The reverb is “Medium Hall”. All of the settings for all of the objects are set to defaults. There is no science to this patch. I simply fiddled with it until I discovered something that sounded good to my ears. For this comparison I did something a little different because these guitars behave differently than the electric guitars that I usually write about. The first thing I did was to play them acoustically. I recorded them as I would an acoustic guitar but sitting with the guitar on my lap and my Olympus LS-10 sitting on the table in front of me point directly at the neck pickup of the guitar. I maintained the recoding levels, attack levels, and distance from the microphones as well as I could. 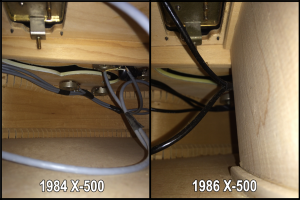 I did this to show the dramatic difference between the 1984 X-500 without the sound block under the bridge and the 1986 X-500 with the sound block. I did not sound level normalization on these recordings; what you hear is exactly what was recorded, though I did trim off unnecessary junk before and after the recordings. Next, I set the LS-10 in front of my Axe-FX with the aforementioned Jazz patch. All of these recordings were done with a .50 Dunlop pick because, so help me, I did not have a heavier pick in the house which is funny to me because I used the same single 1mm pick for ten years once. Yes, I never drop pics, and yes, the pick was a terrible mess. I did two things while recording these snippets: a chord progression and a quick pentatonic lick. For each recording I play each selection once for each pickup selection starting from neck, then to both, and finally the bridge. With the guitars plugged in using equal amp settings, you can hear how the 1984 X-500 without the sound post is much boomier when the neck pickup is involved. 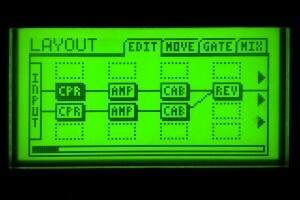 I also find it interesting that the soundblock-equipped 1986 X-500 has a much tighter response when plugged in. Finally, I did the unthinkable and recorded myself abusing both guitars with my wretched finger-style playing. Please accept my sincerest apologies if those last two recordings make you cringe, but dammit, I needed to record these guitars in a way that a lot of people would probably use them. Again, I detect a bit more tightness in the bottom end of the 1986 X-500 with its sound block. I could have likely backed off the boominess of both of them by removing the speaker from the floor but that seemed an awful lot like real work so I elected to pass. As you may know from reading my other Guild reviews, I prefer larger necks on guitars. While the 1984 walnut guitar does have a more narrow 1 5/8″ neck at the nut, the depth of the neck is a bit deeper than most of the 1970s Guilds I’ve played which makes the overall playing experience much nicer than it is on those pencil-necked mid-’70s Starfire guitars, at least for this guy with his freakishly long fingers. These are big guitars. If you’ve never played one of these big jazz boxes, they’re basically about the size of a dreadnaught or jumbo acoustic, but heavier depending on the materials involved. They feel like heavy guitars, but weighing in at 8 lbs 7 oz, the 1984 X-500 lighter than many of my solid body guitars. The 1986 X-500 weighs 9 lbs 2 oz, and I imagine the difference of 2/3 of a pound is as a result of that sound post which is a big solid block of maple. I think part of the reason these seem so heavy is due to the fact that it looks and feels like an acoustic, but most acoustics don’t weigh nine pounds. The fact remains that these are very big guitars with a relatively small necks, the combination of which is a little weird for me, but it’s easy to forget about all of that once I start playing because they both sound so damn good plugged in. Still, because these are such a big guitars, they can get boomy when playing, especially if you play it hard it like you might a solid-body guitar. As I wrote in the pickups section, I found that lowering the pickups with my chosen strings really cleaned up the boominess. For me, articulation (the ability to hear individual strings in a chord) trumps all, and with a clear tone I can alter it using the amp. 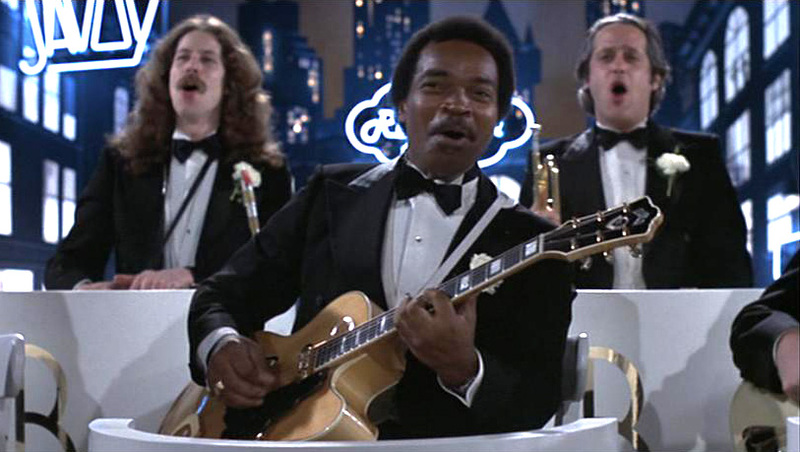 With the beautiful wood and great HB-1 pickups the character of the guitar shines through, and that’s really what you want if you’re in a jazz band like Matt Guitar Murphy playing Minnie the Moocher with Cab Calloway in the Blues Brothers (with a 1968 Guild A350 and a floating DeArmond pickup, I might add). The 1984 X-500 guitar is fully hollow, and just sitting with it on my lap, the low E string on it will start to vibrate and then feedback with a nice, low, clean, tone. If left to its own devices the feedback will increase until everyone in the surrounding area curses my name but, hey, that’s what master volumes are for. If your fingers come off the strings (say, in-between songs), then turn down the master volume because this beast will feed back in style. The cherry burst 1986 X-500 with its massive sound block does not feed back like this at all. The playability of this style of guitar also changes pretty significantly depending on what type of strings you favor. Being a long-time rock player, I tend to like round-wound strings, but many players prefer flat-wounds on jazz boxes because that finger-sliding sound is considered obnoxious in jazz, and having tried them on both of my X-500s, I think the big guitar body further amplifies that terrible sound. 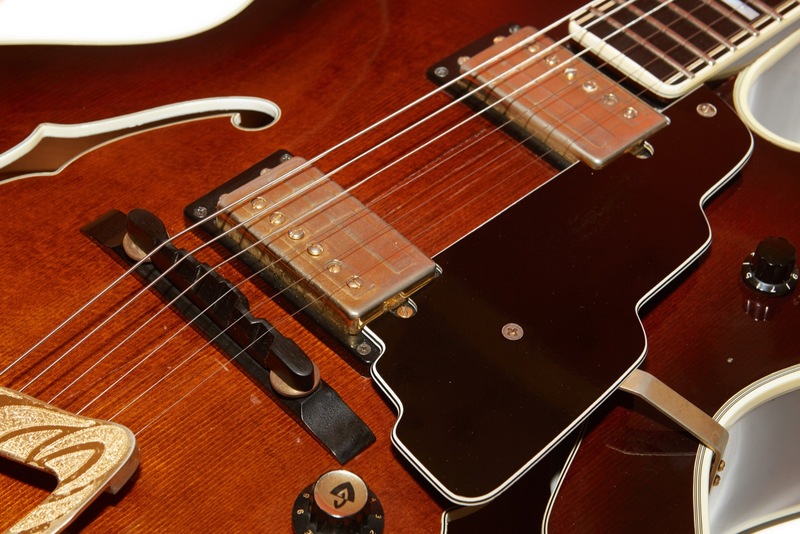 The problem with flat-wound strings is that they sound a bit darker than round-wounds, and for rock players who often chase brightness to the extreme, that can seem counter-intuitive. Jazz players don’t look for brightness, and in fact prefer the tone rolled off a bit (or a lot), especially when comping chords. To compromise a lot of users will use semi-round strings which add a touch of brightness yet also reduce string noise. 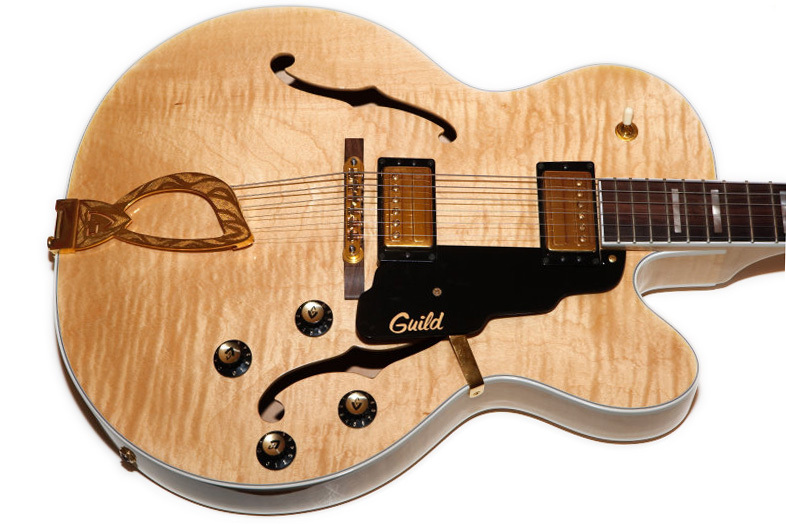 The Guild X-500 is an upscale instrument that is built from the ground up for jazz. It’s big, it’s fully hollow, it has an ebony bridge, and will deliver all the beautiful tonal complexities of such a guitar with graceful aplomb, provided that it’s set up properly for the strings of your choice. Make no mistake, these are expensive guitars. I usually see these selling on the used market for over $2000, and often much more than that depending on the level of departure from reality embraced by the seller. Are they worth it? That really depends on the condition of the instrument in question. Having owned two of them, I would be willing to pay for one that was exactly what I wanted with a wider fretboard, original HB-1 pickups, and no sound block under the bridge. Sadly, from what I can tell, that combination only exists in the much more expensive X-700. When Guild was owned by Fender, these X-500s were being made but they were shipped with the Fender HB-1 pickups which I generally dislike, but if your style is more jazz than rock, those pickups may work for you. Don’t discount these early 2000-era X-500s because they are still very well-made instruments that often show up in mint condition because they’re only 10 years old or so. I don’t know if those ’00-era X-500s have an under-bridge sound block, but my suspicion is that they do so if that’s important to you, make sure to ask before you buy. 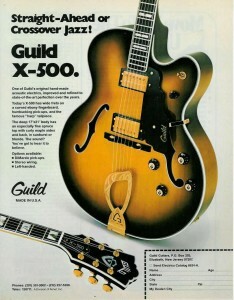 Also, X-500s (like most Guild electrics) after about 1990 or so started coming with 1 11/16″ necks. As much as I like these guitars, having one with a wider neck would be a priority for me. So much so, in fact, that I may sell off both of these and search for a pre-1995 X-500 or even an X-700. Therein lies the problem with these guitars: they’re fantastic. If the X-500 is so great, it really makes me wonder how amazing an X-700 must be. As you probably know, GAS is the colloquial acronym for Guitar Acquisition Syndrome. It is a disease, and guitars like these are the fuel that feeds the flame of perceived gear inadequacy. I know a couple of guys that have a collection of Guild X-500s, and after owning these for a while and playing it extensively, I can see why. Are they the same as the coveted Guild Artist Award? No, but they don’t pretend to be. They’re not $8,000, either. Should you buy one? Only you can decide that. 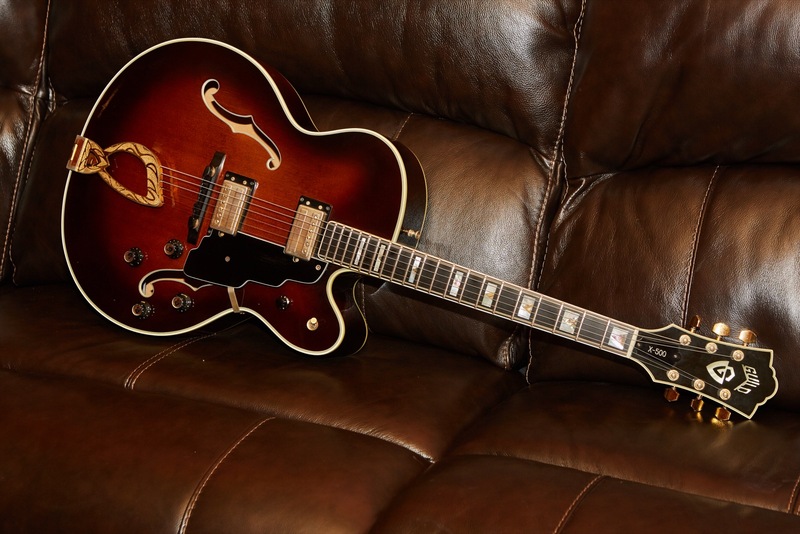 These aren’t $650 1981 Guild M-80s that you might buy on a whim but rather serious, expensive, high-end instruments that you buy for $2000 on a whim. You know, because GAS. Thanks for the nice article and honesty. Did you buy any chance buy the Walnut X500 around 2012 ish from Stow Massachusetts? Also do you still have the Walnut X500? I bought the Walnut X500 in 2016. I don’t remember from where. It has since been sold. GAD, I love Guilds as well. It’s funny at the end of your article you mentioned the M-80. That was my 1st new guitar I ever bought 1983. I own a X-170 as well, as you mentioned and I did change out the rosewood bridge. I own 6 Guilds and I prefer the smaller necks as I don’t have real long fingers. I think I will be down sizing as to upgrade.